Bashar al-Assad is the 19th and current President of Syria, holding the office since 17 July 2000. He is also commander-in-chief of the Syrian Armed Forces, General Secretary of the ruling Arab Socialist Baath Party and Regional Secretary of the party’s branch in Syria. He is a son of Hafez al-Assad, who was President of Syria from 1971 to 2000. 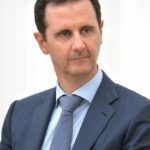 Born and raised in Damascus, Assad graduated from the medical school of Damascus University in 1988, and started to work as a doctor in the Syrian Army. Four years later, he attended postgraduate studies at the Western Eye Hospital in London, specializing in ophthalmology. "Today, the Iraqi citizen sees that America is coming and wants to occupy his country and kill him, and he is willing to experience for himself what happened in Palestine." "None of us and none of the Arabs trust Israel." "As soon as the legitimate Lebanese government is convinced that the conditions have ripened and that Lebanon is able to maintain stability on its own… Then, the Syrian forces will return to their homeland." "We, in Syria, our point of view stems from our experience." "We believe that Lebanon has been the first real experience for all the Arabs." "When we analyze this war in a materialistic way and ask when is it going to end and who will be the winner and the loser, it means that we do not see the endgame." "You cannot reform your society or institution without opening your mind." "Is there an equality of power between America and Iraq? Definitely not; however, the Iraqi people are standing fast and are defending their land courageously."